This is the first test game I've played, solo, using a homebrew rules mash-up of FUBAR, Space Marine, Epic and Rogue Trader. They are intended for 15mm games that are quick with a bit of old school Rogue Trader crunchiness. Tentatively titled Epic Failure. Prologue. In the grim dark future Planetary Governors' still throw cocktail parties to which they invite local notables such as Colonel Léghajó of the 3rd Quotidian Imperial Guard leaving the zealous, but reliable, Senior Commissar Williams nominally in charge of the garrison while he's away. The Colonel has been cornered for the last hour by the local Cardinal, with his 'niece', who's buttonholed him on the subject of new regimental chaplains. Suddenly an adjutant bursts into the hall bearing an important message. The 3rd was in open mutiny all the commissars at the garrison apparently dead and a deputation on its way towards the Governor's residence spouting heretical nonsense like 'democracy' and 'franchise'. The Governor clearly spooked contacted a detachment of marines from the Rufescent Templers chapter passing through the sector requesting that they restore order immediately. Two tactical squads of marines with their Rhino transports rush to meet two platoons of advancing Guardsmen. 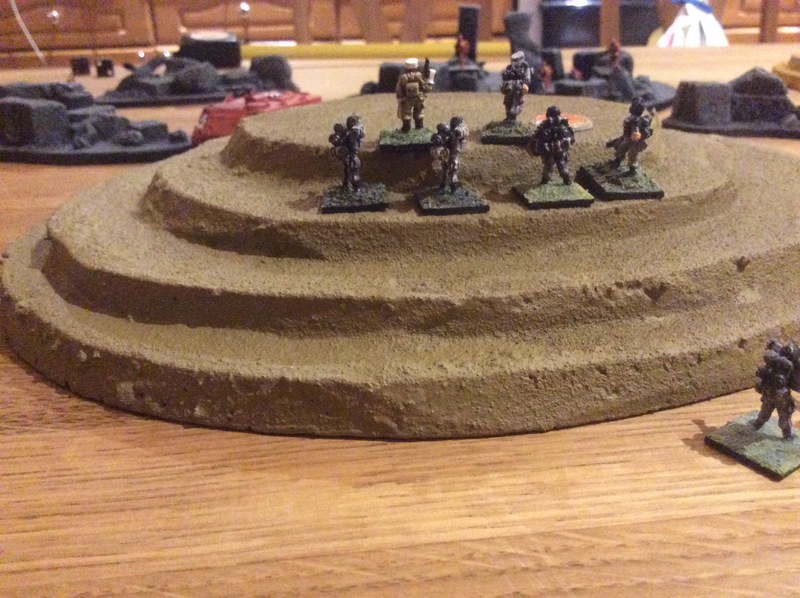 1st Platoon, two tactical squads and a command section, facing off against marine 1st squad, over the desert dunes, and 2nd Platoon, also two tactical squads, facing off against 2nd squad across some ruins of a long forgotten conurbation. The marines split their squads to give themselves greater flexibility. The forces are based on the Rogue Trader army lists published in White Dwarf – points wise the force are fairly even with the Guard having the edge. Though this doesn't reflect the particular differences of a game with activation. Setting the general tone of the battle the marine units all successfully activate in the first turn and start advancing. 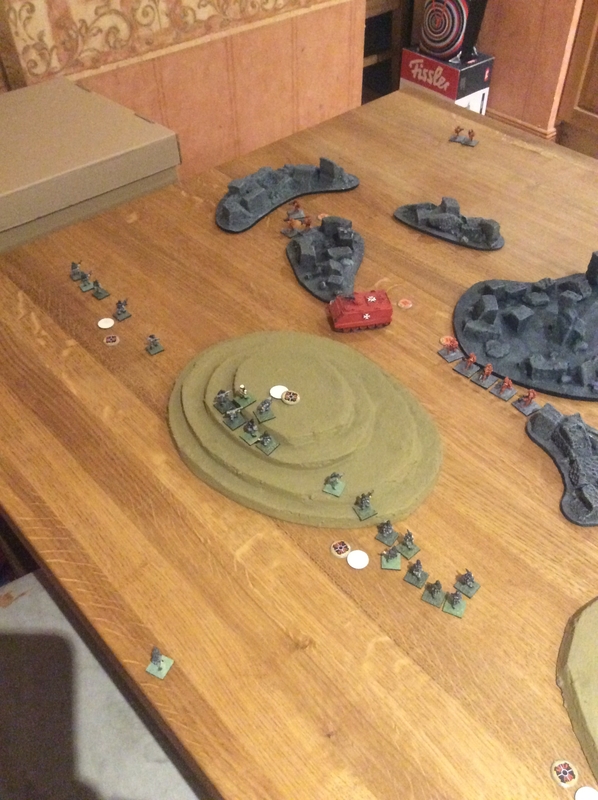 The Guard's 1st platoon successfully manages to activate a squad and 'charges' forward. While 2nd platoon's command section set off up the hill in front of them leaving both its squads stayed put. On turn two the marines 2nd squad 'charges' into the cover of the ruins. 1st squad keeps up its steady advance into the dune field. Only one squad of Guardsmen bothers to move. 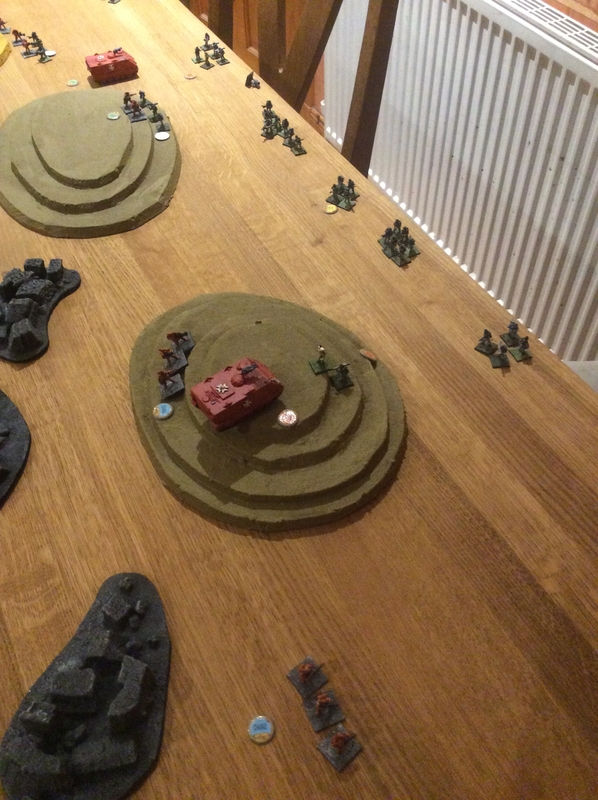 Turn 3 sees some action with the 1st squad's Rhino darting forward into bolter range and peppering a Guard squad to no effect. 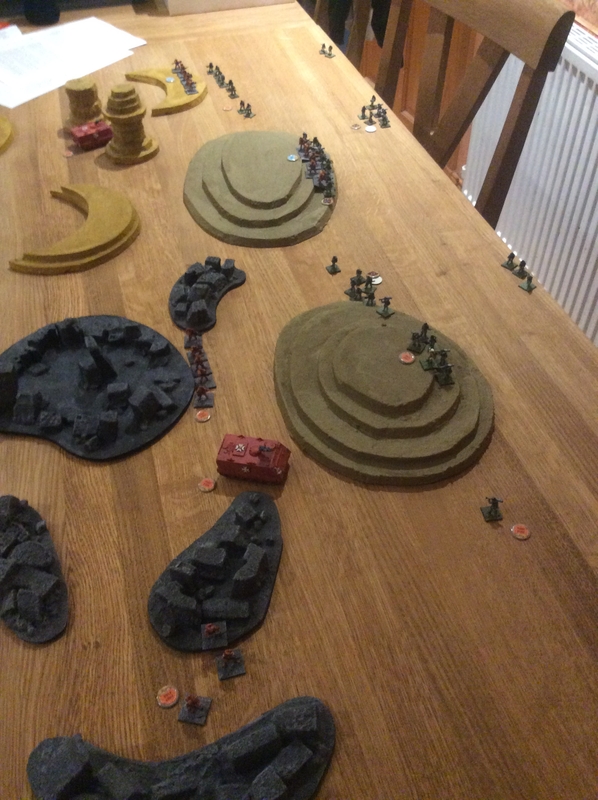 The left-hand half of the 1st squad fluffs its activation and play passes to the Guard, the 2nd Platoon command section fails to active but defaults to overwatch, with the chance that it may catch some part of the marine 2nd squad when it activates with its two las-cannon. The 2nd squads Rhino also fails its activation roll and stubbornly sits still. Turn 4 sees half of the marine 1st squad again failing to activate and the Guard failing to capitalise on the opening they've been given. The 2nd squads Rhino claims first blood gunning down a Guardsman with its bolters. 2nd Platoon then activate with aimed fire orders, but their favoured target, 2nd squads Rhino is out of line of sight, so they ineffectually fire at marines in the ruins below. Turn 5 starts with 1st squads Rhino hitting a Guardsmen, who makes his saving throw, and then part of the 1st squad fails its activation. The Guard attempts to activate a squads on their far left flank, unsuccessfully as usual, but for once there are marine units still to move. So the default to overwatch isn't worthless. The opposite marine half-squad advances incautiously into the edge of las-gun range and looses two marines! The rest of the Guard stays put. On turn 6 the marines of 2nd squad get some pay back felling three Guardsmen including two with a frag missile. This means that 2nd Platoons 2nd squad have reached their break point and a moral check is in order, but they pass. As turn 7 progresses the marines of 2nd squad shoot more guardsmen while 1st squad charges into contact. In one case banking a little too much on the Guard's inability to activate! Fortunately marine armour is tough. 2nd platoons command section activates, but can't see anything to shoot at. While the sole remaining las-cannon armed Guardsmen of their 2nd squad activates, hits the Rhino, but is robbed of an heroic shot by a successful saving throw. In turn 8 the Guard get two more marines in the shoot out between 2nd platoon and 2nd squad. More shockingly 2 marines from 1st squad go down in close combat with the Guardsmen! This is followed in turn 9 by two more marines in the desperate melee, but the Guard loose more and the remnants of one squad retreat off table. Turn 10 is the closing turn. The last las-cannon in the 2nd Guard platoons command section hits the Rhino, but merely stuns the crew for the following turn. 1st squads Rhino pays for its lack of caution taking two mobility hits from the 1st platoons command section, fortunately neither are critical hits. 1st squad also looses sufficient marines to be 'broke', but unsurprisingly passes its morale check. Notes to self. I think I'll tweak the Guard so they activate a little more reliably and improve the marines saving throw from 4+ to 3+ – which was actually a Rogue Trader -era tweak anyway. The Guard had 8 las-cannons in total and I figured the Rhinos wouldn't last that long, but they were restricted by their poor activation. In the end the Rhino's were charging back and forth peppering the Guard with bolter fire in a very cavalier manner, for which they nearly paid a high price. Whole thing took about 3 hours including set up and tidy up. So quick enough for my purposes. 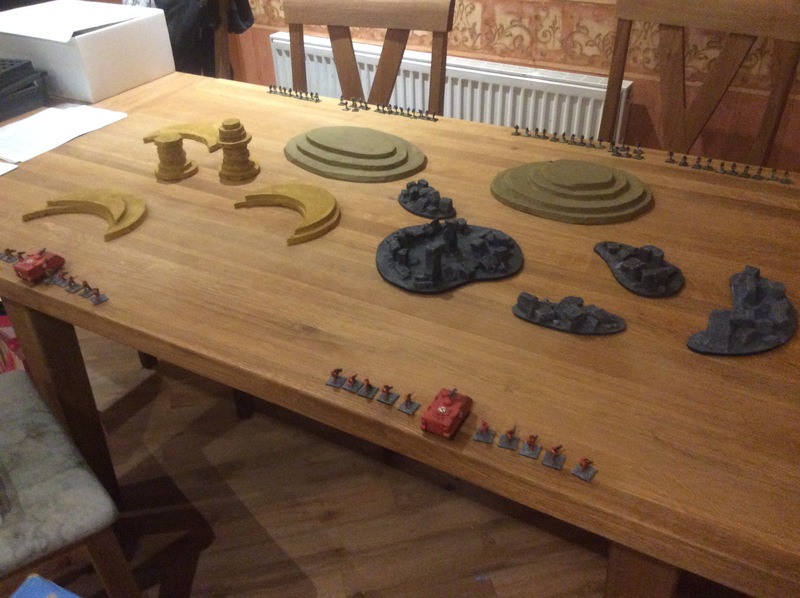 I also must take a look at the unit coherency and get some proper order counters and blast templates printed out. Epilogue. With the rest of the regiment claiming all those involved including the ringleaders died at the hands of the Rufescent Templers, and no survivors of the post-battle summary executions to contradict this under interrogation, the colonel returned to his command. The acolytes of the local Inquisitor had been and gone, surprisingly quickly, commandeering only a couple of the regiments more outstanding specimens and leaving a report filed with the Administratum. The report noted an utter lack of any 'outside influences or taint' and noted that 'failure of NCO's to resolve argument over guardhouse duty rosters does not constitute, when it comes to the powers of a commissar, cowardice in the face of the enemy'. The unpolished bare wood table top actually works pretty well to give the impression of striated ground. The red M113s are a nice touch. I've mixed 40K's mechanics with FUBAR's activations and orders and it's worked wonders for me. Glad to see someone else is doing the toolbox thing as well.